Microscopic image of human head skin (scalp) with hair roots. The roots are colored red. This time I photographed the cross-section of human head skin, a commercial permanent slide. The final image was assembled from 6 separate pictures. The individual hair roots / hair follicles can be seen nicely as red, elongated structures. 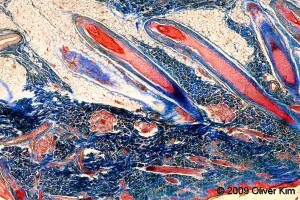 The surface of the skin is towards the bottom. Not all of the hair seem to reach the outside. This is because the microtome cut was not absolutely parallel to the hair (the hair was cut diagonally). We only see a two-dimensional cross-section of a three dimensional structure. I do not know what the red, round, curly structure is towards the middle-left, I assume some kind of gland (either sweat or oil).